What’s the last thing you want to hear with a house full of guests and breakfast cooking on the stove? “Oh no!! The toilet’s overflowing! !” You rush upstairs in your slippers with your trusty plunger in tow only to realize on your 40th compression that this may be a bigger problem than you thought. Plumbing problems are super common in home ownership and not nearly enough people know how to address even simple plumbing fixes. In fact, 40% of all homeowners have experienced a loss due to water damage and 93% of water damage can be avoided by simple prevention, maintenance, and quick DIY repair know-how. Here we go over 10 of the most common home plumbing problems homeowners face, how you can fix them yourself or what you should expect the fix to be, and advice on when to throw in the towel and call a professional plumber. We also will discuss some prevention tactics to avoid problems in the first place. You wake up in the middle of the night to use the restroom and it hits you like the gong of a grandfather clock. Filling the room and the hallway is the steady sound of a drip, drip, drip, dripping faucet. You chase the sound around the house and finally locate the offending sink in the guest bathroom. You turn both knobs on and off and the incessant drip continues. What do you do now? Shove your earplugs in and go back to bed? Probably yes in that moment but, first thing in the morning you tackle that repair head on. While being such a common home plumbing phenomenon many homeowners are stumped on how to handle it. Some just decide to live with the constant thump and the hit to their water bill. Surprisingly, fixing a leaky faucet is not as complicated as it may seem. Your first step is finding out which type of faucet you have. There are four different types of faucets and each requires a different fix. A simple online search can help you determine which you have. These are the most likely types of home plumbing faucets to have leaks because they use rubber washers to seal the valve seat. Rubber washers wear out and need to be replaced every few years or anytime there’s a problem. Simply replacing the rubber washer will likely solve the drip. Remove the decorative cap from your faucet handle, remove the screw, pull the handle out and use a wrench (duct tape the jaws so you don’t scratch your sink) to remove the packing nut. Remove and replace the seat washer that was being held by a brass screw. Put everything back together and you should be good as new. These types are far less likely to develop leaks but it can happen. Luckily, your neighborhood hardware store should have kits to easily replace the entire faucet assembly for around twenty bucks. Make sure to lay out all the parts in the order you removed them on the towel so you can use this as a guide to put all the parts back. If these fixes don’t solve your problem call a professional plumber. Explain what you’ve tried and they will take over from there. There’s nothing worse than jumping into a hot shower at the end of a long day and finding the showerhead producing maybe enough pressure to rinse your hair. Luckily, there are a lot of home plumbing repair options to try before you have to call in a pro. Is the pressure low throughout the whole house? Check your home’s water supply main shut off valve. Make sure the valve is open all the way. Simply open it up completely if it isn’t to up the pressure throughout your whole home plumbing system. If the pressure is only low from one fixture, say the shower upstairs but all the other faucets are fine, it may be a problem with the faucet or showerhead itself. Most of the time the faucet is suffering from an aerator that’s clogged with buildup. Unscrew the nozzle of the faucet or showerhead and check for buildup. If you see some grime the piece can be soaked in a vinegar and water bath overnight. If it still doesn’t look great in the morning you can buy a new piece fairly inexpensively. If these fixes don’t work you are probably looking at mineral deposits clogging up your pipes. This is best handled by a plumber. This one is another annoying but super simple repair. All you need to do is open the lid on the back of your toilet and check inside. Confirm that the flap of the paddle is flush with the hole in the bottom of the tank and that your chain is in tact and functional. Generally, one of the these will be faulty if you have a running toilet. Pick up a replacement assembly at the hardware store and this home plumbing repair is done in a snap. You don’t even need any tools just your fingers. Remove the offending innards and replace with the new ones. Running stopped. Bravo! Have you noticed bits of water pooling at the bottom of your toilet bowl. If you have confirmed that it’s not simply little boys with bad aim and it truly is a leak you can easily fix this home plumbing conundrum with a little help, some elbow grease, and believe it or not, wax. You’ll need to turn the water off for this fix since you have to lift the toilet up from its normal resting spot. To accomplish this you’ll need to disconnect some water pipes and the last thing you want is to flood your bathroom trying to fix a small leak. Don’t skip this step! Remove the nuts from the bolts on either side of your toilet. These are usually underneath a cute little plastic cover, just lift those up and get in there with a wrench. Have your buddy help you lift the toilet straight up off the bolts once the nuts are removed. Place it on the side. You should now see the old wax ring. Scrape that one off the drain using the scraper being careful not to damage any of the others bits and bobs down there. If it’s been there a long time this could take some doing, stick with it. Remove the bolting hardware from the toilet once it’s been removed. Being pretty gentle put the new wax ring where the old one was and lightly press it into place. You aren’t trying to make any impressions in the wax just trying to get it to stay in place while you place the toilet. The toilet will do the actual pressing into place. Install the new bolts and carefully place the toilet straight down over the new bolts. Take your time and make sure to apply pressure evenly around the entire new ring and press down firmly on the toilet once it’s in place to make sure it’s got a good grip on the floor. Make sure not to wiggle it around you just want pressure straight down all around. Go slowly tightening the nuts on the bolts because overtightening them can warp the new ring. Make sure the toilet can’t move around and it’s snug against the floor. Reconnect the water and you should be good to go. The hardest part of this common home plumbing problem is finding the leak, to begin with. You may notice a pool of water in the kitchen or bathroom floor and you’ll have to backtrack that puddle to the offending pipe. 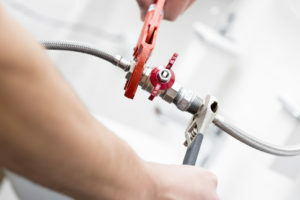 If the leak is at a joint, turn off the water, disconnect the pipe, apply joint sealer to the inside of the threads and rejoin the pipe. This should solve your leak. If the pipe has small holes or any type of crack it’s definitely best to call a plumber because you could have bigger issues. Also, leaks can be super hard to find. Always better to call in a professional than try and open up a wall on your own. They have specialized equipment to locate the leak. Anyone who has ever had folks with long hair, kids, or a bunch of guests in their homes knows all about is a slow drain. These always happen at the worst times and leave you standing in a soapy puddle in the shower. What’s great is this home plumbing problem can most definitely be solved in an inexpensive DIY Drain Cleaning. Grab your trusty vinegar and baking soda and take a trip down memory lane to 3rd-grade science. Just like the volcano project you loved as a kid, the explosive power of vinegar and baking soda can do the trick to unclog stubborn drains. Use 1/2 cup of baking soda to one cup of vinegar in each stopped drain. Use 1/2 cup of baking soda to one cup of vinegar in each stopped drain. Wait for 20 minutes and follow up your volcano explosion with a large pot of boiling water in each of the drains. It should run straight through. If this doesn’t work you could try one of the numerous clog remover gels on the market. If both these tactics aren’t working or you notice anything backing up into your drains definitely call a plumber. This issue could actually be the next most common home plumbing problem, septic tank back up. If your kitchen sink seems to be the main culprit of slow draining it could be a jammed garbage disposal. Make sure that the only things going down your disposal are remnants of dinner as you rinse the dishes. Using your disposal as a second trash can is a bad idea. Peels can get wrapped up in the blades, fruit pits can dull blades, pasta or rice can expand and clog pipes, and grease is always a no go down the disposal. If you are facing a jam you can do the baking soda and vinegar trick above. This should blow out most of the gunk. Next, put some ice down the shoot with the water and disposal running. The ice will sharpen the blades. After sharpening cut up a lemon in small pieces and feed them one at a time through the disposal. The citrus juice will clean off any remaining gunk and leave the sink smelling lemony fresh. If your slow drains become stopped drains and then sewage starts backing up into your tubs and sinks, you’ve got major home plumbing issues. If you have a septic tank you know this could be a major disaster. Call a plumber right away. They will be able to determine whether a simple snaking of the line will clear the block or if they need to dig up your yard. Either way, this is not something you want to try and handle yourself. When it’s freezing outside the only thing you want to do is curl up with a blanket and nice cup of hot tea. When you go to fill the teapot nothing comes out and you are met with a low grumble from the pipe. The pipes are frozen. You can use a space heater, heating pad, or blow dryer to gently heat pipes that have already frozen to get things moving again. However, this is a long process and is much easier to prevent than solve after the fact. For homes in areas prone to flooding your basement probably has a sump pump in it. This is the home plumbing fixture that will drain your basement in case of a flood. Chances are you’ve never checked it out. Unfortunately, a lot of sump pump problems are caused by lack of routine maintenance. I mean, it’s pretty easy to miss after all. It just sits there in the corner quietly twiddling its thumbs waiting for some water to invade its domain. But, once the 8 feet of snow that got dumped in the last winter storm starts to melt and trickle into your basement you’ll be pretty upset if it remains idle without kicking into action. Make sure to refer to the manual for your sump pump and find a good source for proper maintenance of the pump. Before rainy seasons in your area and before the first thaw of the year make sure to run through your maintenance list. If you notice anything wrong with your maintenance call a plumber. Eventually, as a homeowner, you are going to face some home plumbing problems. Being proactive and well maintained can save you thousands of dollars though. Your best bet to avoid costly emergency repairs and being caught with a house of guests and no working toilets is to have a plumbing maintenance and protection plan. Work with a good local Grand Rapids plumber who can put together a home plumbing protection plan for you so you always know the state of your pipes. Have a doozy of a plumbing story you think we would like to hear about? Connect with us on Facebook and share it, we love to hear from you!